This year's English Cross Country relay championships were held on a fast but muddy course at Mansfield's Berry Hill Park last weekend, returning to this popular venue for the 25th time. This is the premier relay event on the Cross Country calendar and attracted an entry of over 3000 runners with all the top teams in England represented. 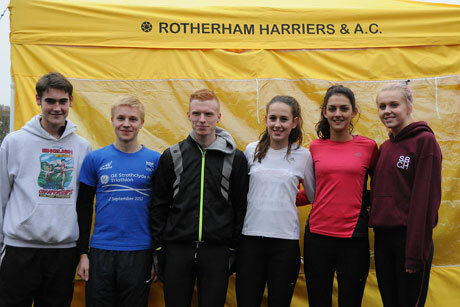 For the first time Rotherham Harriers had entries in every age group and fielded two full teams in both senior men's and lady's events. The growing number of club athletes competing was rewarded with the club's best ever result as the Senior Ladies took a stunning fifth place in a star studded field. With the Junior Ladies placing 10th and two other teams in the top 20 this was the best set of results in this prestigious event in the club's history. The senior women's A and B teams lined up in a highly competitive field that included almost all of the GB cross country team members and Rotherham's team of girls, all born and bred in the town, set a new Harrier's record with the A team claiming the club's highest ever place. On the first leg Steph Burns (10:36) gave her usual 100% to fight through the crowded start and hand over in 17th place after her 3k leg. Sam Johnson (10:47) likes nothing better than battling with the big names and once again set about the task with a will. Working hard all the way through the woods and then attacking on the hill Sam brought the team up to 11th place with a 10th place finish being the clubs previous best. Laura Spence working in London showed her loyalty to the club by once again making the long trek to put on the black vest and was given the anchor leg by team manager Nigel Brookes. With other runners in her sights Laura had the look of someone who meant business and stormed through the field with one of the best displays ever seen by a Harrier at this event. With her team mates shouting her on Laura crossed the line in the team's fastest time of the day clocking 10:32 for a superb 5th place finish. The Under 15 Boys have had a very successful season and this continued as the boys raced into 14th place, losing out for South Yorkshire bragging rights by just 0.05s to local rivals City of Sheffield AC. Kane Smith (6:49) got the team off to a great start as he recorded their fastest time of the day to establish them in 20th place after the usual extremely competitive first leg. Declan Walker-Smith(7:19) slipped back a few places and handed over to Joe Masingham in 28th place for the last leg. Showing real fighting spirit Joe (6:52) carved his way through the field into 14th place at the finish, just failing to overhaul the Sheffield runner at the line by a couple of centimetres. Not to be outdone the Under 13 Girls A team were also gunning for a top 20 place and they were given an excellent send off by Mya Taylor (7:59) on leg 1as she took them into 28thnplace. Grace Harris (8:13) got the team up into the top 20 and Annabel Johnson (8:06) set off in 19th place on the last leg. Showing her experience even at this tender age Annabel chased down three more runners to finish in a highly creditable 16th place. The Senior Men's race is always ultra-competitive and with just under 200 teams of 4 athletes entered this was definitely so this year. Two Harrier's teams lined up with the A team seeking to finish in the top 50 as a realistic target. Kyle Craib (17:07) took responsibility for the first leg and ran the team's joint fastest time as he fought his way through a very talented field to hand over in 61st place. On leg 2 Aidan Johnson (17:44) consolidated the team's position and sent Richard Harris off in 60th place. Richard (17:07) equalled Kyle's first leg time and took the team into the top 50 as he handed over in 47th to last leg runner Chris Adams. Chris (17:52) has great experience over the country having been selected to represent England at Over 40 international level and he steadily worked his way through the field to complete a good day's work for the team as they showed the benefit of consistent relay running and claimed a highly satisfactory 40th position at the finish. The Junior Men found themselves in a high quality field of 79 teams and aimed to finish in the top half against some very strong teams. Luke Cotter has been having a great season and he set the tone for the team with a blistering time of 9:04 as he took an excellent 16th place against some of England's best Junior Men. Elliot Smales is a rising star of triathlon who has been working hard on his running this year, and his time of 9:59 saw him hand over in 22nd place after leg 2. On the anchor leg Nick Myers (10:34) was coming back to racing after a 3 month lay-off and fought hard all the way to the line to stay in the top 30 with a very satisfactory 29th place finish a just reward for the team's efforts throughout the race. The Under 17 Men had Adam Green on leg one and his time of 10:06 was good enough for 45th place as he handed over to Daniel Bradford (10:53) on leg two. Daniel slipped a few places but sent off Ryan Beale in 52nd place for the last leg. Ryan (9:55) was the fastest member of the team on the day and he passed runner after runner on the course as he pulled the team up into 35th place at the finish. The Under 13 Boys started out with Bailey Stead (7:52) on the cavalry charge which characterises the younger boys races on the first leg and he handed over in 56th place to Matt Stevens. Matt (7:29) was in sparkling form and had taken back 27 places at the end of the second leg as he handed over to Jack Stokes to bring the team home. Jack (8:19) was not able to hold onto all the gains but he ran steadily to the finish and brought the team home in 39th place. In the Under 17 Ladies race Charlotte Dodds (10:18) was first up for the team and ran the team's best time by some considerable margin as she handed over in 48th place. Maisie Elliot (11:59) ran hard all the way to keep the team on course for a top 50 finish as she handed over to Ruby Torry in 54th place for the last leg. Ruby (11:25) was able to gain 6 places and bring the baton home in 48th place. The club's B teams all had good results with the Under 13 Girl's setting the tone in the first race. Keiva Rennocks (8:28) got the team off to a good start and handed over in 59th place to her sister Bronte Rennocks (9:02) who gained one place to hand over to Charlotte Kerr (9:35) in 58th place for the last leg. Charlotte finished in an encouraging 63rd place as the B team demonstrated the club's strength in depth in this age group. The Senior Ladies B team had Colette Bunker (12:34) on leg one and she handed over in 71st place to veteran Janet Hindley (12:55) who pulled back 14 places and sent off Natalie Raynor (13:45) for the last leg in 57th place; Natalie held on to a very good 62nd place at the finish. The Senior Men's B team comprised three veterans and club stalwart Phil Hoole who would normally be a shoe in for the A team but who had not run a race since July and was feeling his way back into racing after such a long lay-off. Veteran Over 50 international John Comrie (19:22) took on the first leg duties and had to fight hard against a class field of senior men mostly much younger than himself to hand over in 130th place to Phil on leg two. Although a minute slower than he can be when fully fit Phil (17:35) was still able to overtake 38 runners and take the team into the top 100 as he handed over to Edward Hardy in 92nd place. Edward (20:01) gave back 6 places but sent off Women's team manager Nigel Brookes on the last leg in 98th place. Making light of his almost 50 years Nigel slipped back only 7 places as the team finished just out of the top half of the field in 105th place.